This panel is devoted to the Australian anthropologist Grant Evans, who passed away in September 2014 and left a rich collection of books, articles and reviews. He devoted a large part of his work to Laos, making him one of the most influential scholars in the field of Lao Studies, but also contributed to theoretical debates regarding the anthropology of State or of kinship. Our panel intends to assess the lasting value of Grant’s work for the knowledge of Tai societies in Southeast Asia and in South China. Grant Evans addressed a range of topics related to the anthropology of Tai societies, including hypothetical early origins in Yunnan, millenarianisms and rebellions in Tai chiefdoms, the situation of Tai “peasantries” in socialist countries, the reinterpretation of Buddhism by the State or the lasting heritage of royalty. How does his work influence the contemporary approaches of Tai social history? Grant wrote several papers on the upland regions, notably on the “Taization process” and tourism; he also studied urban ethnic minorities in Tai cities. What does his work tell us about the attenuation and perpetuation of ethnic boundaries in rural and urban contexts in contemporary Tai societies? Grant wrote about the historical influence of Chinese culture on Tai identity, as well as on the contemporary transformations occurring among the Tai populations China's southern borderlands. Nearly two decades after the publication of his book "Where China meets Southeast Asia," what is the current research on that topic and how did Grant ‘s work inspire it? 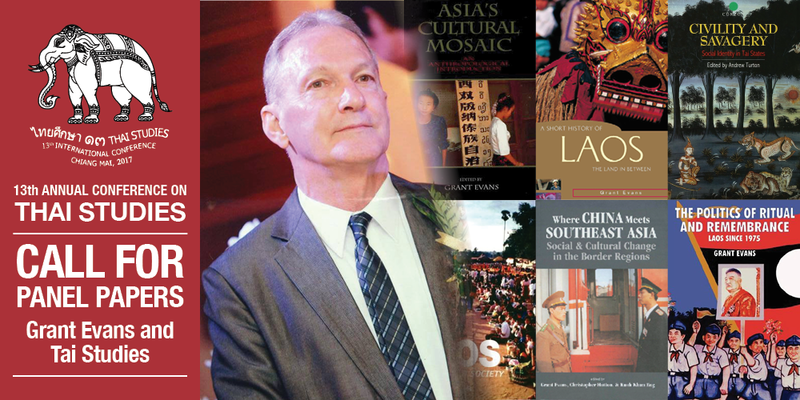 Successively a student activist, leftist writer, journalist, teacher and academic, Grant Evans was one of the first Western scholars to do fieldwork in Laos after the revolution. He was also one of the very few who dealt with political and development issues openly in that country, even under difficult personal circumstances. In recent years, he made several contributions to the debate on the political turmoil in Thailand. What does his personal trajectory tell us about the role and the responsibility of academics, between civil society, media and the State? Abstracts of maximum 300 words are expected before the end of November 2016.